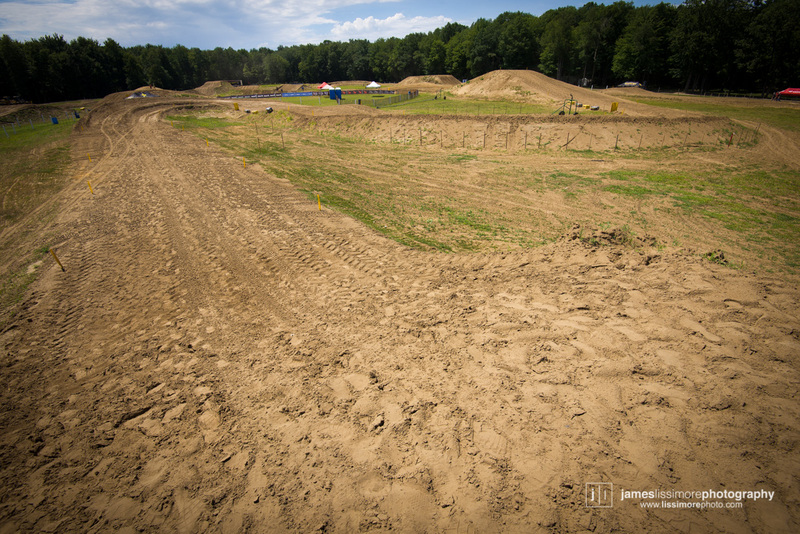 This weekend we were at one of the toughest sand tracks in North America, the Gopher Dunes track, in Ontario. 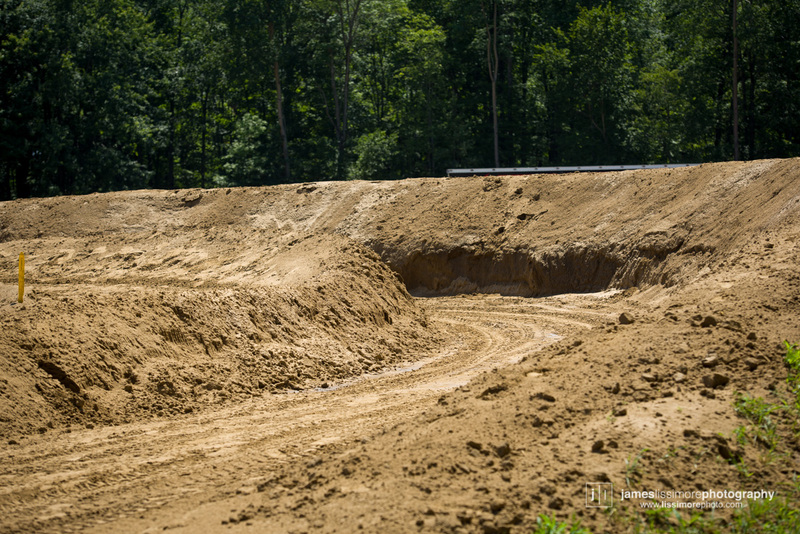 There’s no elevation at the Dunes but Derek “Digger” Schuster and the crew had been hard at work moving sand around to build some new hills for this years race. 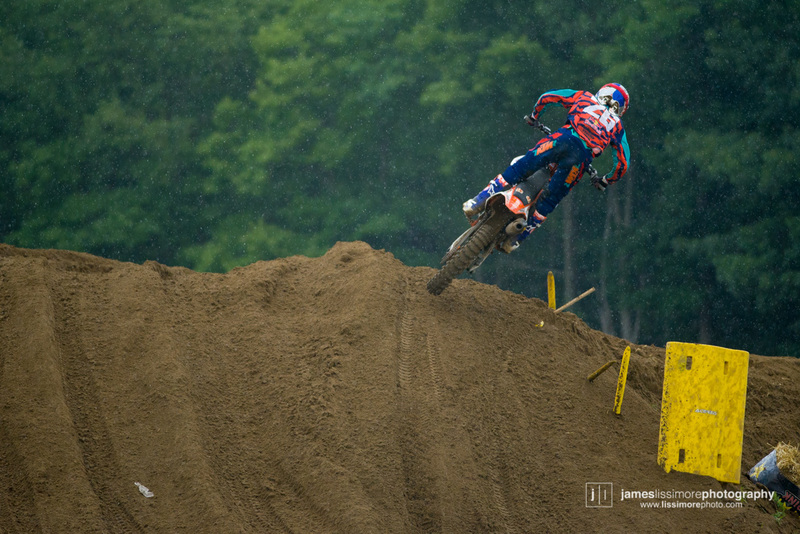 Digger also likes big berms. Or in this case, a wall. 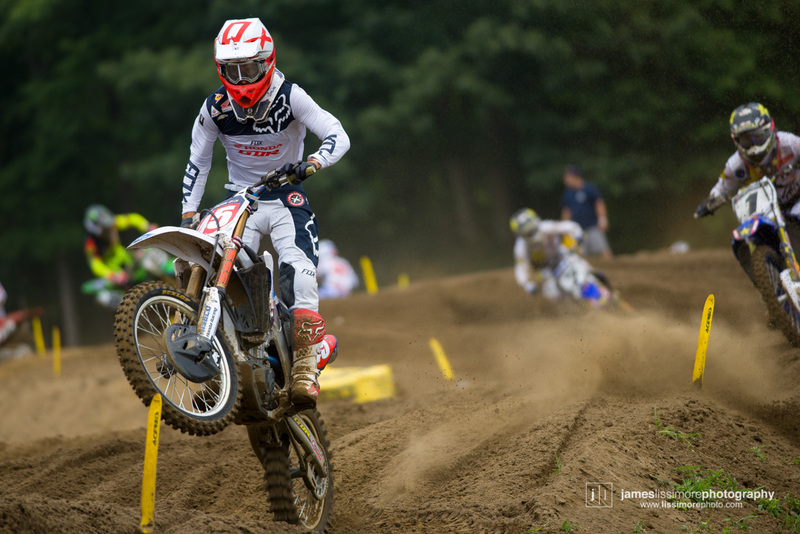 With the Gopher Dunes Racing Honda team of points leader, Colton Facciotti, being based at the track, Digger always likes to roll out a custom bike for their hometown race. 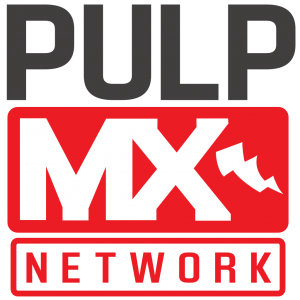 This year the bikes were based on the 1992 Team Peak Honda bikes that Pro Circuit raced. 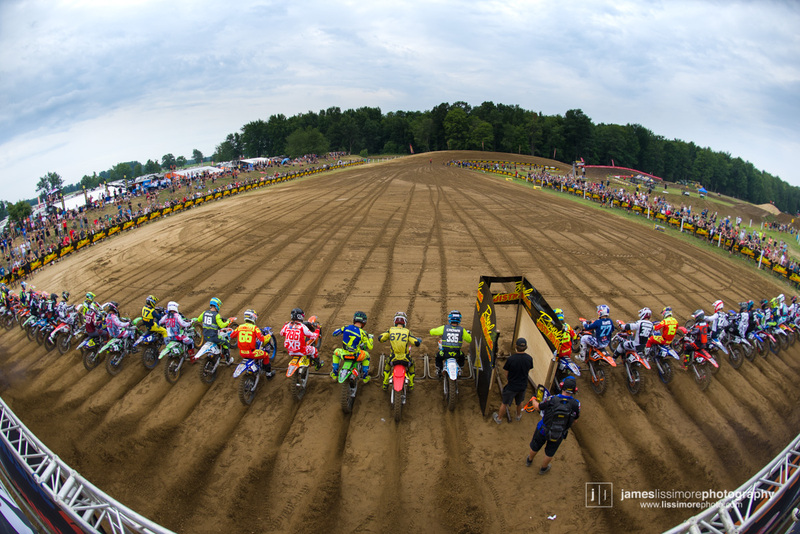 Gratuitous fisheye shot for Matthes of the 250 class blasting off. After a couple weekends off the podium, Josh Osby was back this week with 4-2 finishes for second overall. 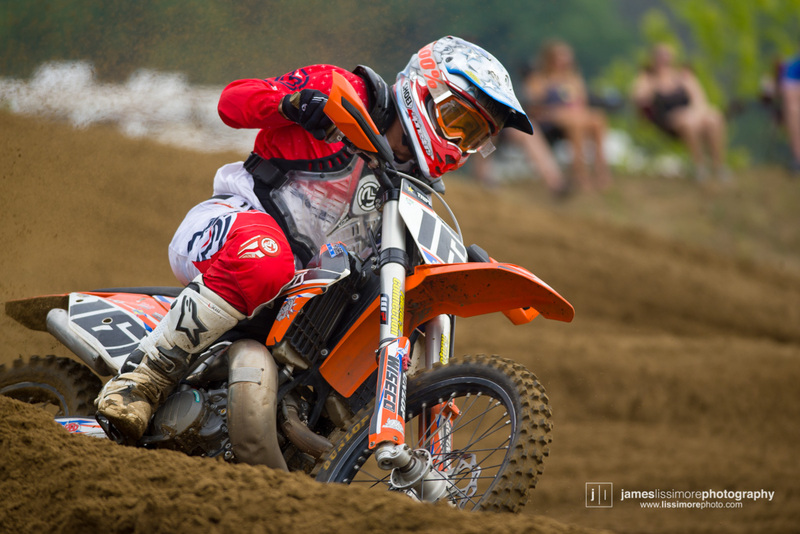 After winning a moto last week, expectations were high for Joey Crown but he was a little off the mark, finishing 6th overall. 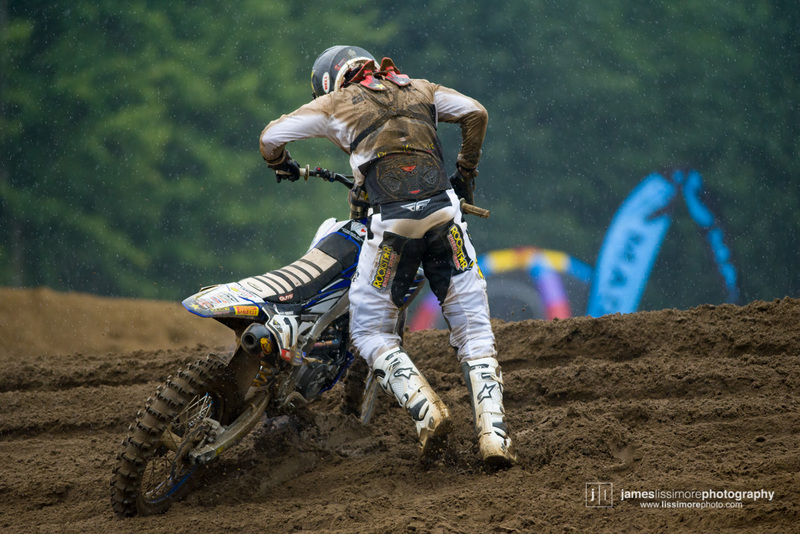 Shawn Maffenbeier’s day started off decent, as he grabbed second in moto one but then disaster struck in moto two when electrical problems forced him out of the moto and he saw his grip on the red plate disappear. 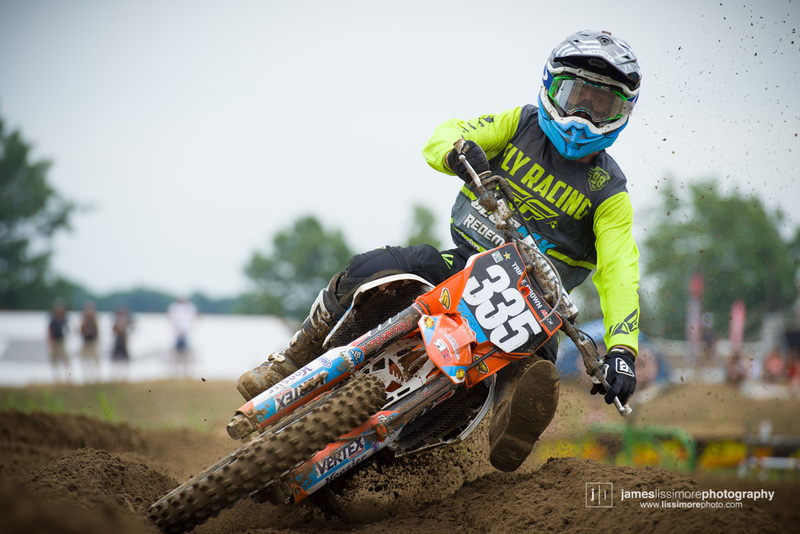 Last week’s winner, Dylan Wright, was fast on the track he’s been living at all season but no goggles in moto one and a crash in moto two left him with 3-6 for 4th. 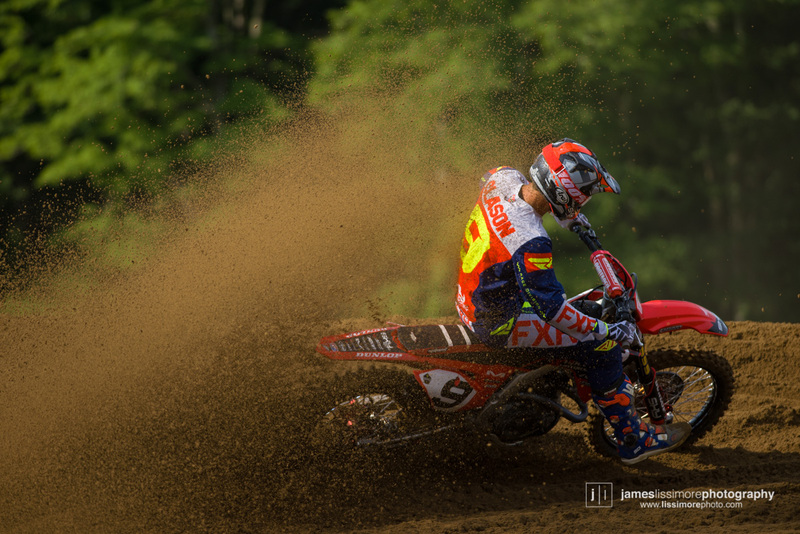 No goggles and a sand track is never a good idea, as Wright demonstrates. 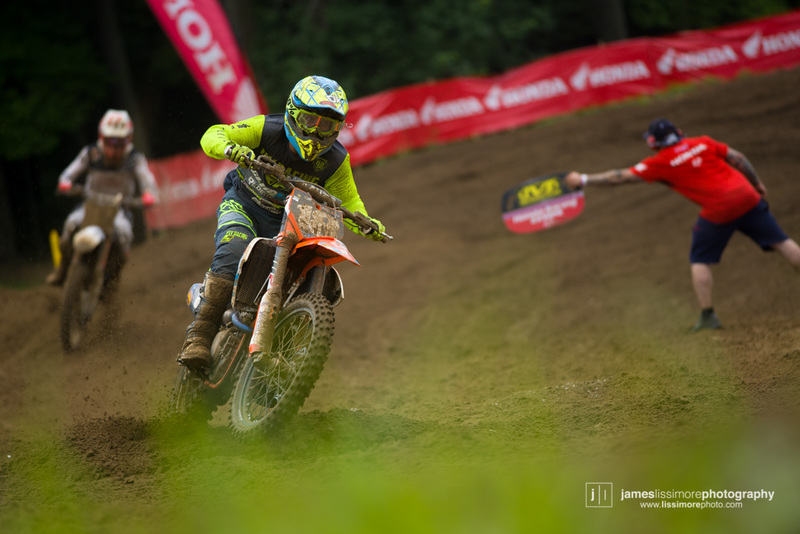 It was an emotional race for Tanner Ward who rode hard to grab his first podium on the season only a week after the passing of his older brother. 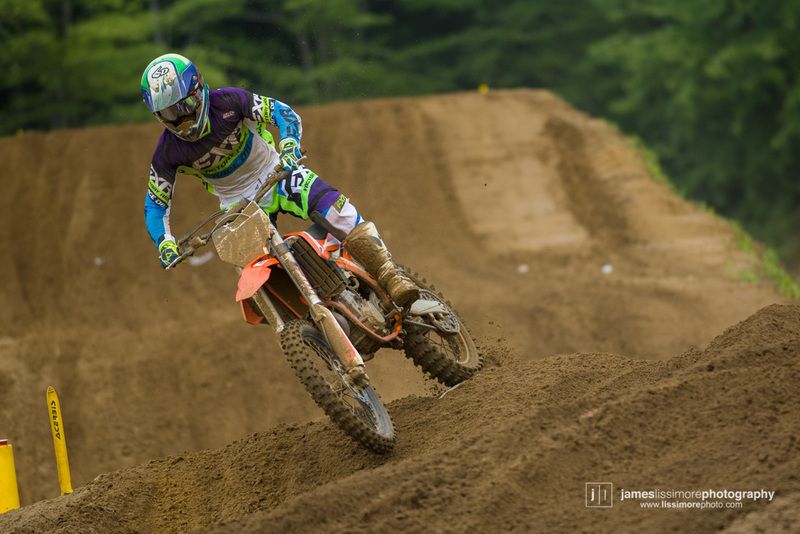 Jess Pettis has been the most dominant rider in the 250 class this year, winning every race that he didn’t have a mechanical problem at. 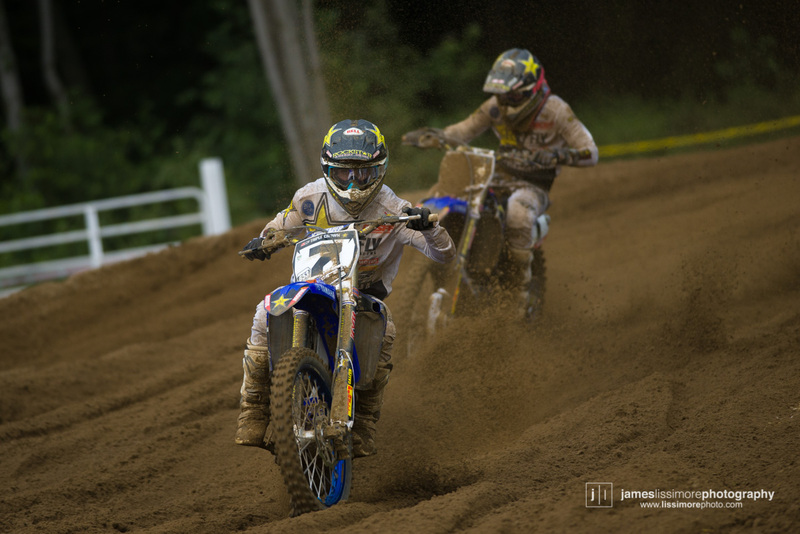 Not known as a sand rider, Pettis put in another two dominating motos to take the win and reclaim the red plate. Signs that you’ve just sucked sand for 30 minutes. 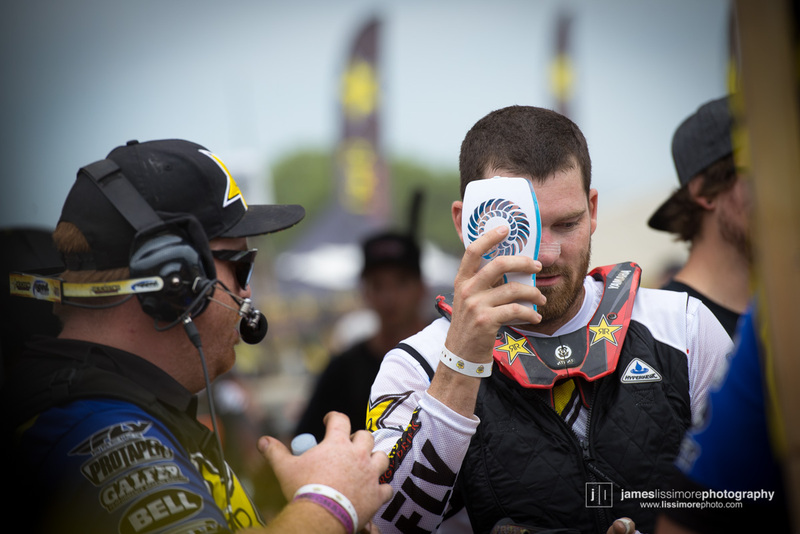 It was hot and humid at the Dunes and riders were trying everything they could to stay cool before the moto, as Matt Georke’s ice vest and fan demonstrate. Colton Facciotti(45), Goerke(1) and Cole Thompson(16) lead the pack. South African turned Canadian, Liam O’Farrell, decided to come out and race after not doing any Nationals for a few years and looked like he hadn’t lost anything, finishing 9th overall. 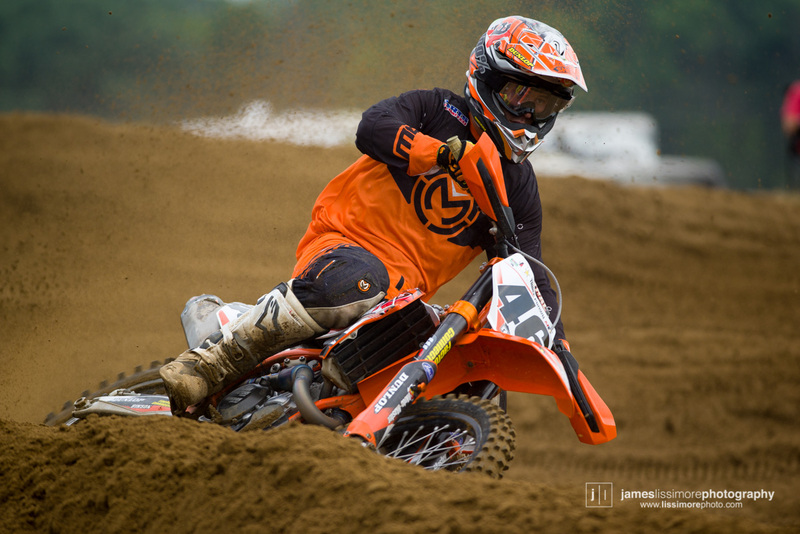 Cole Thompson is a rider who most expected would be contending for wins all season but so far hasn’t been able to make it to the front. 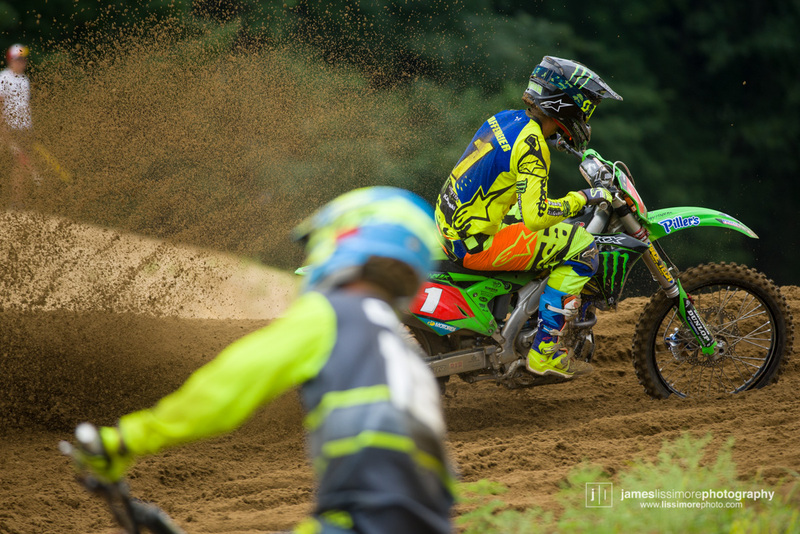 He started to show signs of life in moto two as he pushed close to the lead, eventually finishing second in the moto and fourth overall. 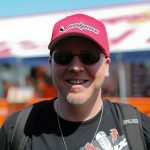 The legend himself, John Dowd, came out to race at Gopher, and on a 250 2-stroke. 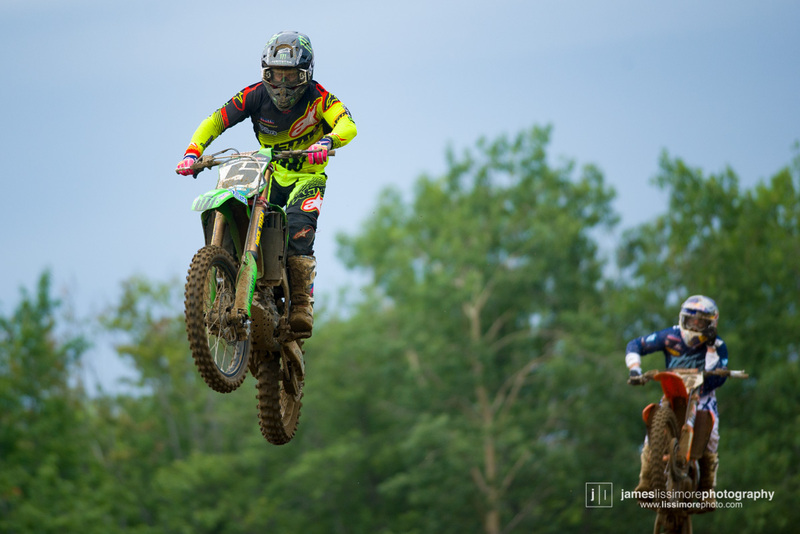 He finished 19th in moto one but decided that that was enough for the day and sat out moto two. New Jersey’s Luke Renzland decided to make the drive up and give a Canadian National a go. 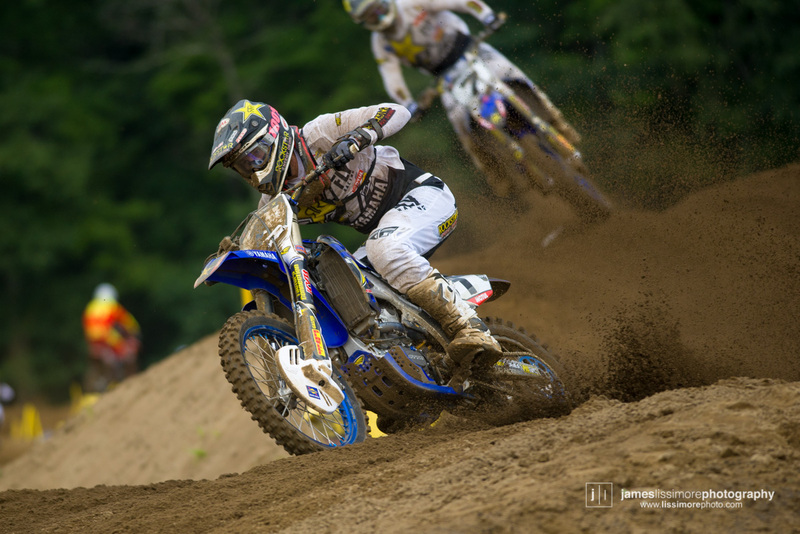 The Trader’s Yamaha rider finished 6th overall. 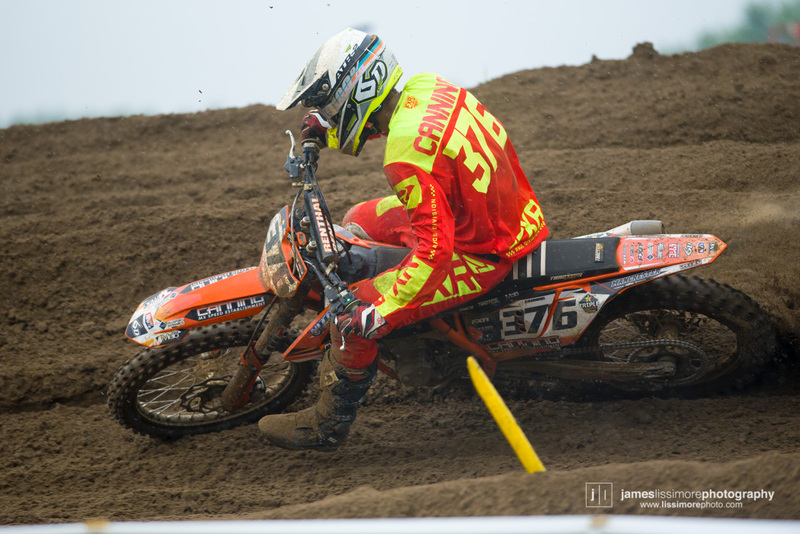 It was a 9-8 day for 8th overall for Cade Clason. John Dowd’s son, Ryan, was also at The Dunes. 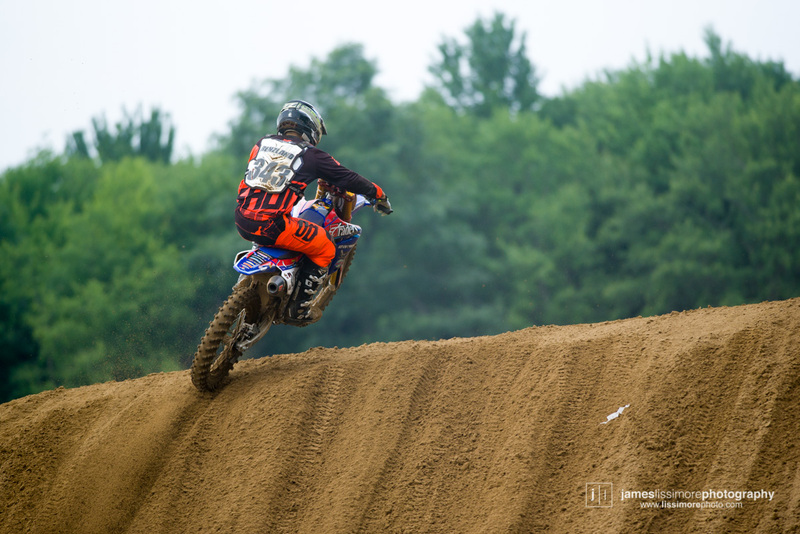 He got a flat tire in moto one and grabbed 9th in moto two. 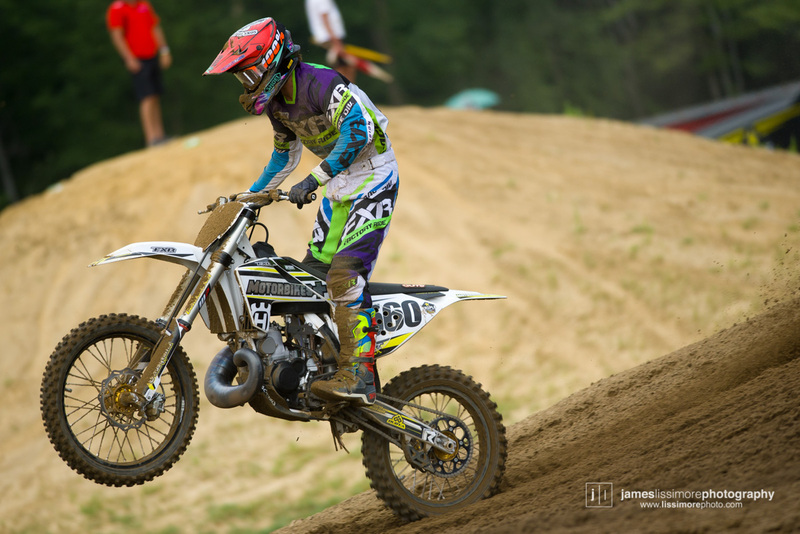 Massachusetts’ rider, Kyle Murdoch, rode a 2-stroke to 15th overall in the 450 class. 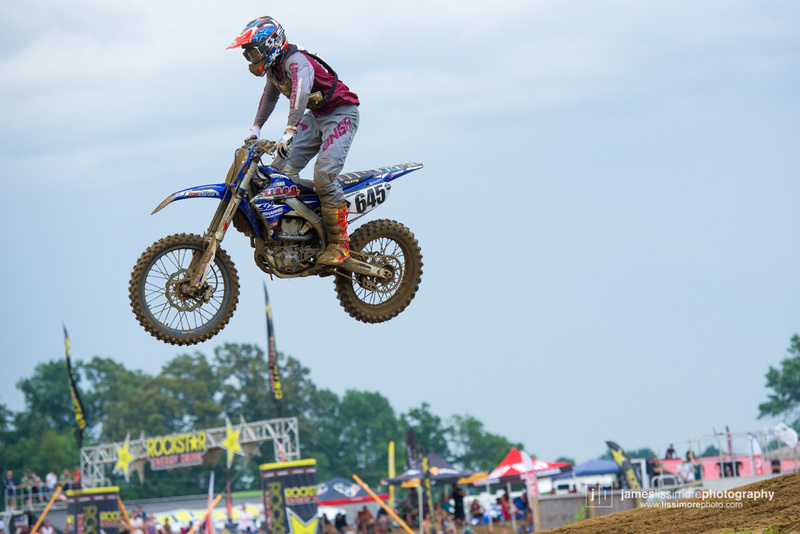 He wasn’t quite able to run the pace of the leaders but Colton Facciotti managed to increase his lead in the 450 points standings with 3rd overall on the day. Texas’ Cheyenne Harmon finished 16th overall. So far in 2018, Dillan Epstein had struggled to adapt to his new team but at Gopher he was back and looking like the rider who was a contender for much of 2017. 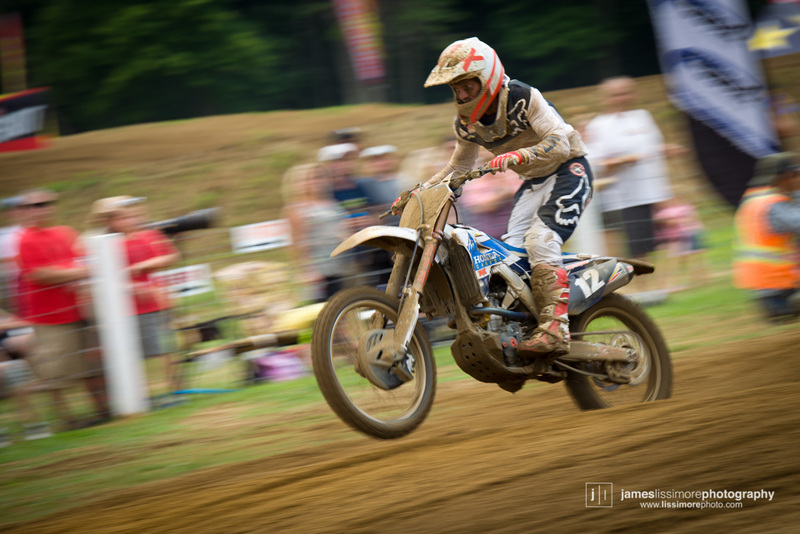 In moto one he had a great battle with his teammate, Goerke, and took the moto win when Goerke fell trying to get around a lapper. 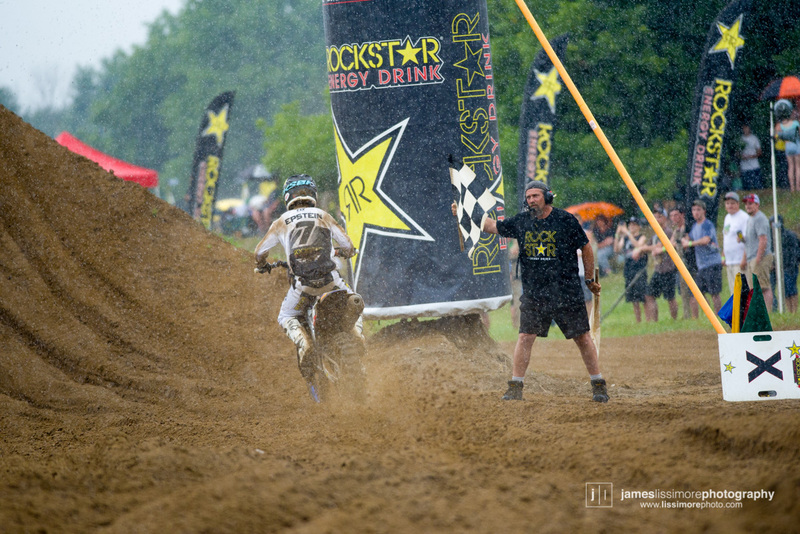 It started raining during the first 450 moto and Epstein takes his first moto win of the season through the rain drops. 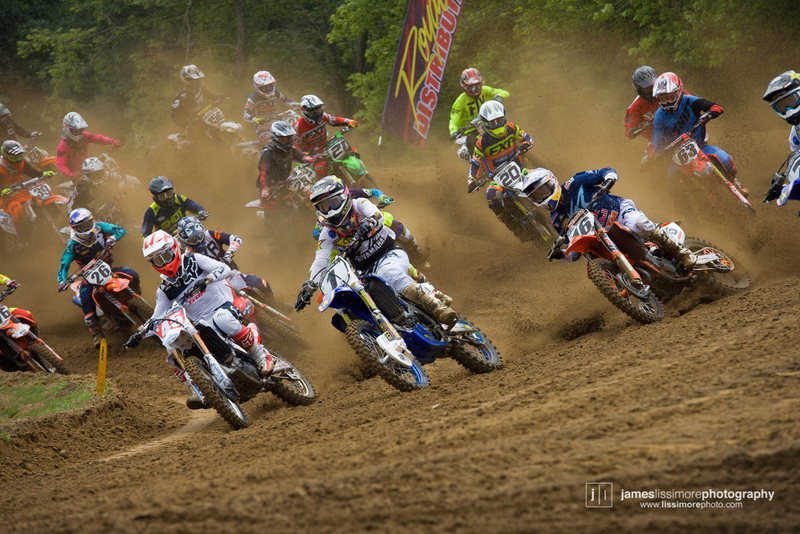 Lots of American’s made the drive up to race the Dunes. Connecticut’s Chris Canning finished 7th overall. 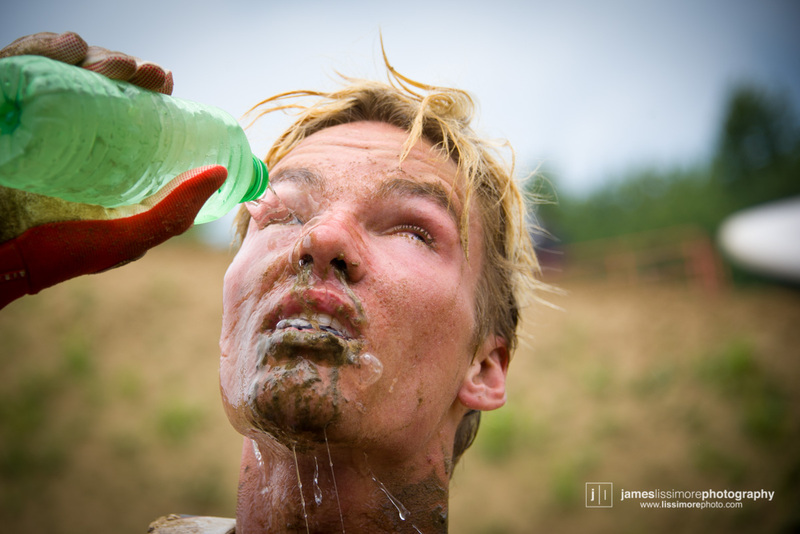 New York’s Jesse Kirchmeyer finished 13th. Michigan’s James Roberts finished right behind in 14th. 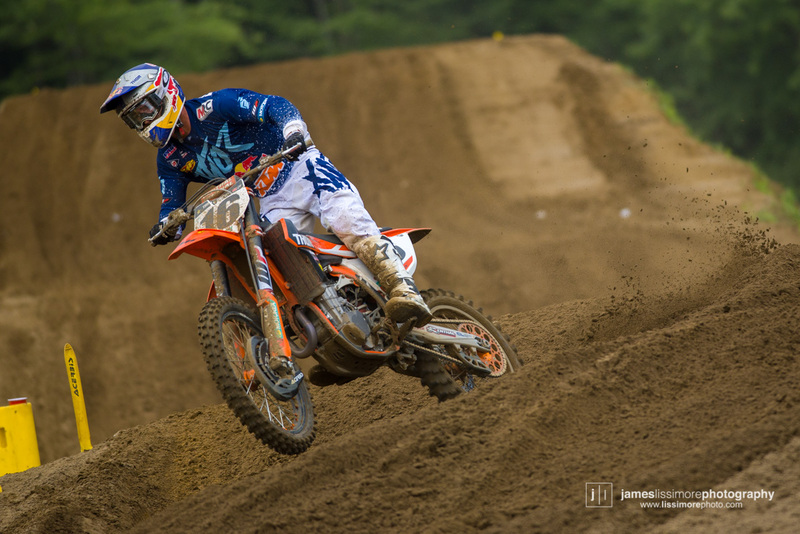 Still hurting from his crash last week in Sand Del Lee, Red Bull KTM’s Kaven Benoit wasn’t able to run the pace of the leaders, finishing fifth overall. 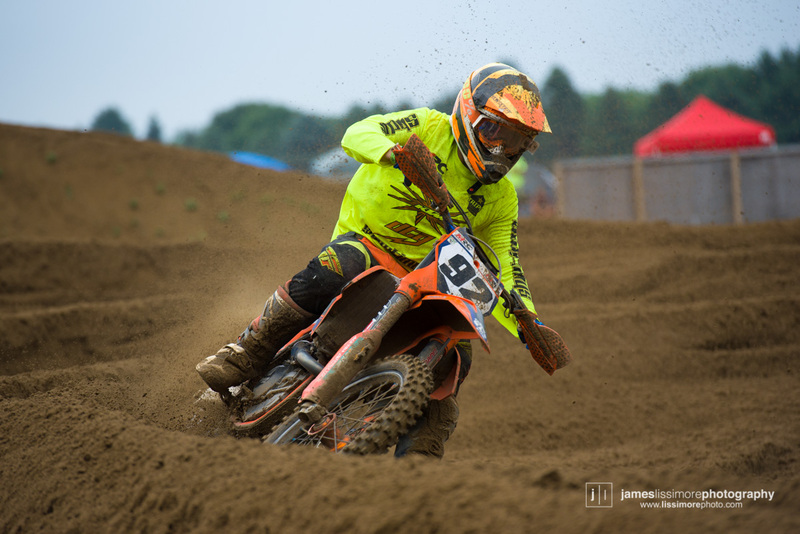 The winningest rider ever at Gopher Dunes, Matt Goerke, looked to be on his way again to victory in the first moto when he went down trying to pass a lapped rider. 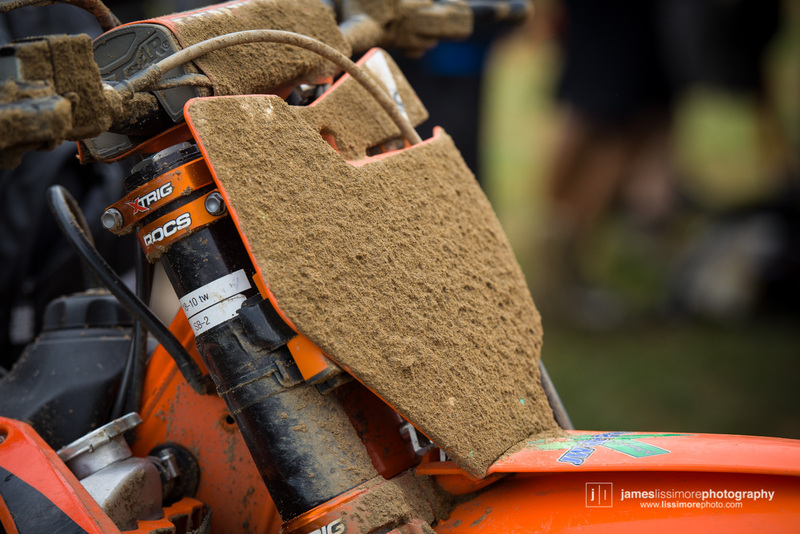 A DNF in moto two and it wasn’t the best day for the defending champion. 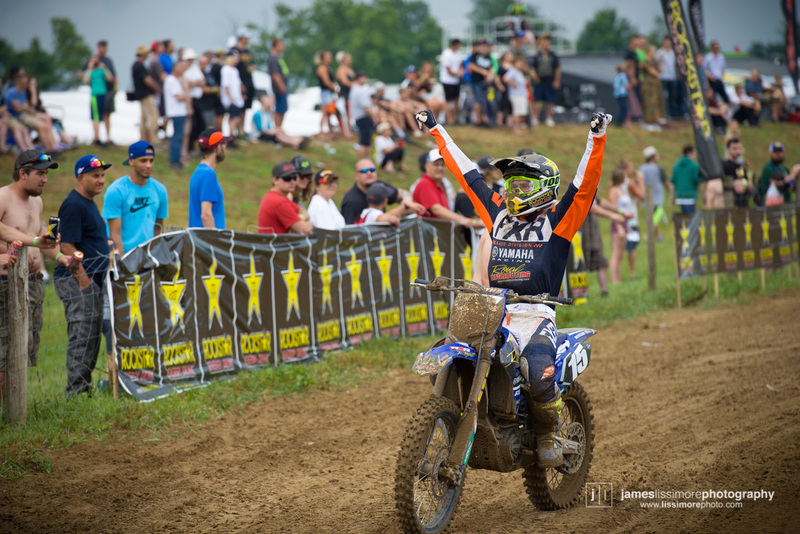 Goerke’s miscue allowed his teammate, Epstein, to take the moto win. 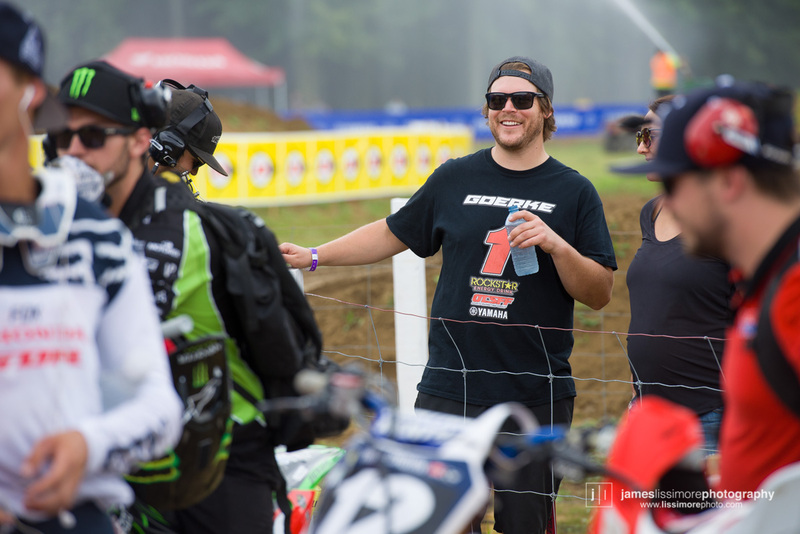 Monster Energy Alpinestars Pillars Kawasaki’s Tyler Medaglia has looked reborn this year on the green bike and at Gopher Dunes he would go on to win the final moto and take his first 450 overall win in ten years, since winning the Gopher race all the way back in 2008. 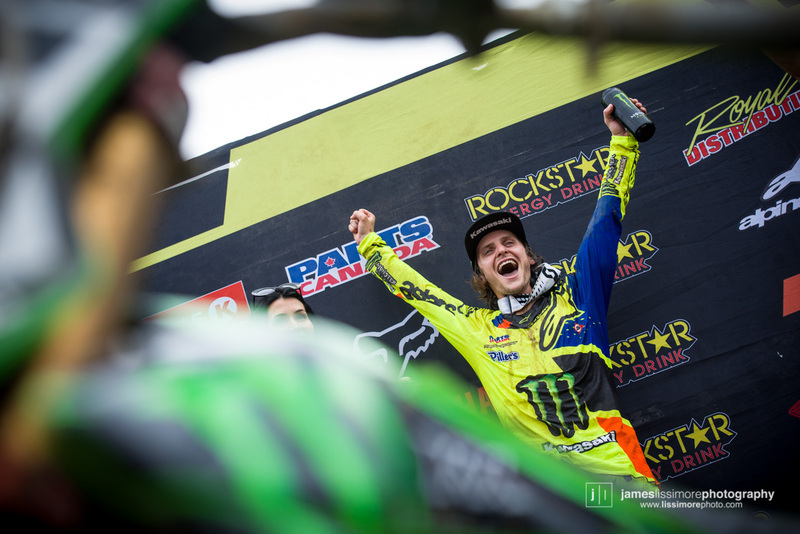 Victory for the two-time 250 champion and fan favourite. 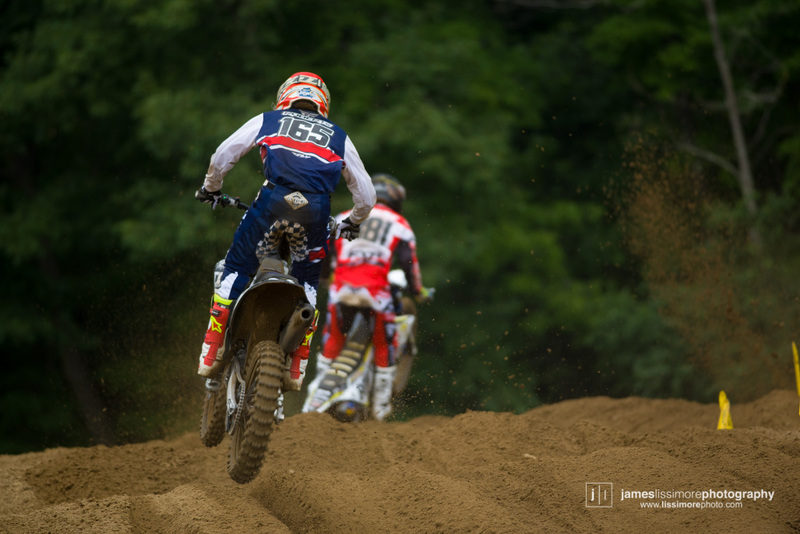 Will we see more from Medaglia as the series moves into the home stretch?